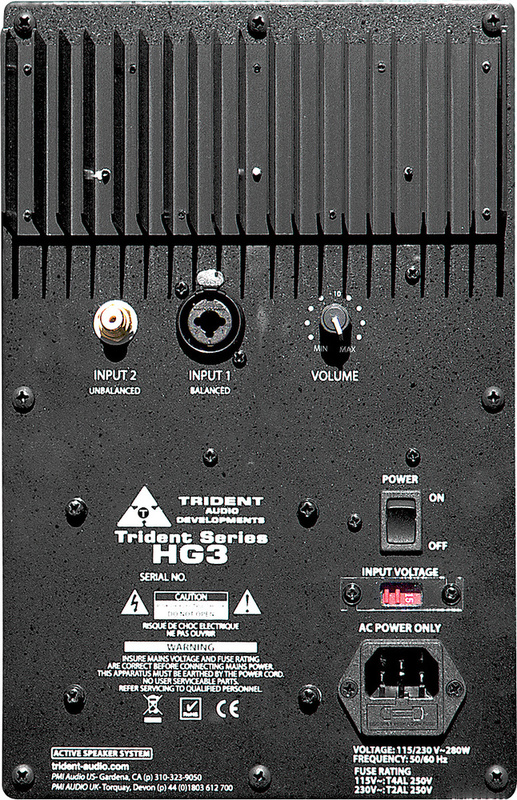 The unique design of the HG3's cabinet is intended to offer the best traits of both large and small speakers. Does it work in practice? It's a fact of life that the loudspeaker is the weakest link in every audio chain, with substantially more distortion and a far less even frequency response than any microphone, preamp, converter or console... and that's just the really good speakers! Of course, the perfect speaker doesn't exist — and isn't likely to in the foreseeable future, either — because the available technologies all involve myriad imperfections, compromises and trade-offs. The role of the speaker designer is to blend the best possible balance of strengths and weaknesses from the available cabinet, driver, crossover and amp technologies, while also meeting a specific set of marketing and design targets which might include, for example, low price, bass extension, high SPL capability, pin-sharp imaging, and so on. Higher retail prices naturally afford the designer greater scope to optimise more aspects, and allow the use of more sophisticated and elaborate designs, so more expensive speakers generally perform better than the cheaper models. 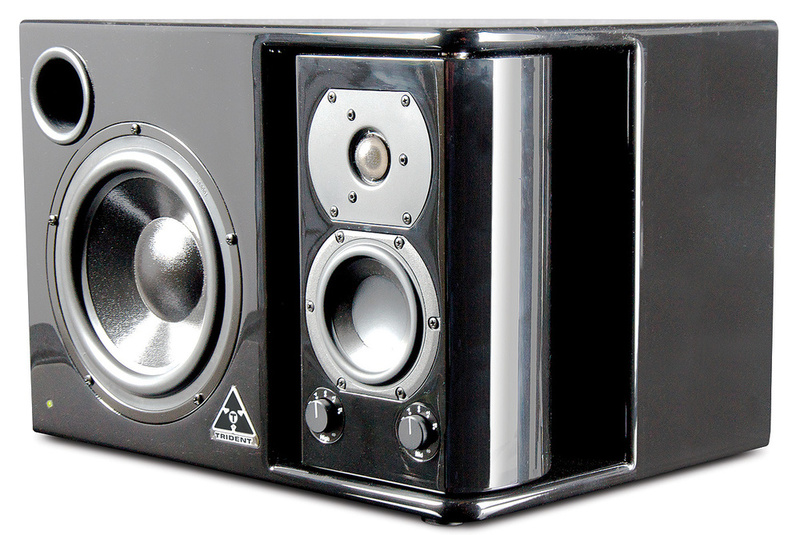 That brings me neatly to the subject of this review: Trident Audio's HG3 close-field, three-way monitor speakers. I first saw and heard the HG3 in prototype form at an AES exhibition at the end of 2009, and have been keen to spend some quality time with them ever since, not least because this design has some quite unusual facets. The first to grab the attention from afar is the paint finish: the HG3 comes in a spectacular piano-black gloss finish, which really makes it stand out. As you get closer to the speakers, their second unusual aspect becomes obvious: a rotating mid/HF 'pod' on the inner corner of each speaker. The cabinets are reasonably large for 'close-field' types (I presume that translates as 'nearfield' on this side of the Atlantic), too. They measure 311x 450 x 336mm (HxWxD) and weigh a chunky 16.5kg each, so I'd actually describe them as more of a mid-field design in terms of size and scale. The HG3 is an active three-way monitor speaker, but not quite in the conventional sense, because it's actually an active/passive hybrid. The mid-range and treble drivers are coupled via a passive crossover driven by a single 60W RMS MOSFET amplifier, while the bass driver (described as a 'subwoofer' in the rather hyped marketing literature) is driven by two more identical amplifier modules, each connected to a separate voice coil, to provide a total of 120W RMS for the lows. These power ratings seem quite conservative, as the HG3s are capable of going painfully loud when necessary. The main cabinet (constructed from MDF, as most speakers are these days) is a relatively conventional reflex design containing only the single, long-throw, eight-inch bass driver, with a front-venting port located above the woofer on the outer side of the front baffle. The inner side of the front baffle is cut away to accommodate the unique, sealed-cabinet 'pod', which has a flattened-cylinder shape and is mounted on hidden pivots top and bottom. These allow the pod to be rotated over a pretty wide angle, so that the four-inch mid-range driver and 1.125-inch soft-dome tweeter can be aimed as necessary towards the listening position. The space in the main cabinet behind the pod is used to accommodate the amplifier chassis. The marketing literature claims that this rotatable pod "lets the listener position the critical directional components [...] without the need to move the cabinet into a precarious balance position”. While this is technically true, I have to say that in over 30 years of installing monitoring systems I've never found myself wishing I could rotate the speaker after installation! Moreover, engineering a reliable rotating contact system is non-trivial and inevitably raises the question of long-term reliability — and on that point, I think integrity demands that I should mention that the first review pair of HG3s had to be replaced because one speaker's pod would only work when turned fully inwards. However, this was probably just a case of 'Sod's law' and careless couriers, and perhaps some users will find the ability to rotate the pod after installation genuinely useful. However, there are some very valid technical arguments in favour of the 'pod' approach, and that's what we need to concentrate on. The primary benefit is that this unusual design — with the pod rotated inwards to some degree — minimises the front baffle area around mid-range and HF drivers, while its smoothly radiused sides reduce edge diffraction. The latter is a common feature of most speakers these days, of course, and there are plenty of ultra-compact 'satellite' speakers around with similar baffle dimensions to the HG3's pod. However, compact satellites have an inherently poor bass extension and need to be used in combination with a subwoofer. Designer Harvey Gerst's solution in the HG3 is to incorporate the bass driver with the 'satellite' speaker in an ingenious way, combining the best attributes of an integrated full-range speaker with those of a compact satellite. The advantage is a massive benefit in stereo-image precision and stability. Very small, narrow speakers always produce stereo images that are significantly sharper and more stable than most large, wide speakers can manage. The down side, of course, is that a narrow, small baffle makes it very hard to accommodate large enough bass drivers to provide good LF extension. Some systems use a tall floor-standing approach, with several small drivers on the front panel working together to deliver the bass. Some use narrow but deep cabinets, with the bass drivers on the sides (or even on top). The HG3 design has taken a different but equally valid road. The separate pod enclosure also helps to prevent any LF cabinet resonances and vibrations affecting the mid-range and high end, as well as moving the mid-range/HF sources away from the potentially turbulent airflow created by the bass driver and its port. So these are all worthwhile engineering benefits, regardless of whether anyone wants to readjust the driver angles from time to time! The back panel features only the balanced and unbalanced input sockets, and an input trim control. One of the primary benefits of all three-way speakers is that the mid-range driver handles pretty much the entire (uber-critical) mid-band region all on its own. Most two-way designs share the mid-range between the bass and treble drivers, and that brings a can opener to the tin of worms that is crossover level and phase misalignments, driver dispersion incongruities and various other issues — all of which potentially conspire to impair the mid-range transparency. Three-way designs inherently circumvent these difficulties, albeit with more complexity and cost. The HG3's crossover frequencies are set at 320Hz and 3.5kHz, so the mid-range driver has to handle only about 3.5 octaves across the crucial voice band. The bass and treble drivers also each handle similar bandwidths, which seems like a very fair division of labours! Located on the pod baffle, just below the mid-range driver, are two wire-wound rotary attenuator controls. These adjust the sensitivity of the mid-range and treble drivers to allow tonal balancing for personal preference, or to suit the room acoustics. These enable up to 2dB of boost when fully clockwise, and reduce the level all the way down to fully off at the counter-clockwise extreme. I found the balance best with the controls in their centre positions, although being able to push or pull the mid-range slightly was handy on occasions. The rear panel of the main cabinet carries a heat-sink area across the top to help cool the three amplifiers (it does get fairly warm in normal use), with the input connectors and an input sensitivity (volume) control located just below it. A 'combi' XLR/jack socket accepts balanced or unbalanced signals, while an RCA phono socket is also provided for connection to domestic equipment. A power switch and the ubiquitous fused-IEC mains inlet complete the rear-panel features, while a dual-colour LED on the front indicates when the speakers are powered up (green) and when the amplifiers are running out of headroom (red). The HG3 monitors claim an overall frequency response stretching between 35Hz and 19.5kHz within a ±2dB tolerance, which is very impressive, while the published response plots hint at a mild mid-range recession. The bottom-end 12dB/octave roll-off is ensured by an electronic 30Hz high-pass filter, which protects the bass driver from damage due to unwanted subsonic energy (an inherent danger in reflex designs, where acoustic driver damping essentially ceases below the cabinet's resonant frequency). Surprisingly, the published specifications don't provide a maximum SPL figure, and the sensitivity is quoted in terms of dB/Watt at one metre, which, although useful for a passive speaker, isn't particularly relevant in an active one with a line-level input! An SPL figure at one metre for a given input signal level in dBu would be far more useful. An equally meaningless specification of -104dB is given for 'Typical Noise', and I presume this refers to the amplifier module's noise relative to its full output power. Again, the acoustic SPL generated by the speaker's quiescent noise would be far more informative. Similarly, a THD figure of 0.05 percent is provided but, again, I think this relates to the amplifier's total harmonic distortion, rather than the actual acoustic distortion of the amp and speaker combination. However, while the published tech specs are rather unhelpful and largely irrelevant, the actual performance is very impressive. The HG3 can go surprisingly loud, if necessary, has very low quiescent noise, and is extremely transparent and neutral, indicating very low harmonic distortion levels. I arranged the HG3s on suitably sturdy Zaor stands, initially about 2.5 metres apart (so mid-field distance, really) and well away from rear and side walls. I set up the cabinets to face straight down the room with the 'pods' on the inside edges and rotated about 30 degrees inwards to aim the mid/HF drivers just behind the listening position. This configuration minimises the front baffle area seen by the mid and HF drivers, of course, optimising the imaging capabilities. The imaging was the first thing I noticed when I played my stack of reference CDs. The manual recommends Diana Krall's Love Scenes album as a reference track to highlight the HG3's capabilities (it is actually one of my own favoured auditioning albums, too). The HG3s generate stunning stereo images, with pin-sharp positional details, both left to right and front to back. The 'sweet spot' area is also larger than most, and the image remains stable with frequency. I've heard similarly precise imaging from small satellite speakers before, but very few conventional speakers of this size come anywhere close to this level of imaging precision. Tonally, the HG3s are very well balanced through the mid-range and high end, sounding open and airy at the top and ruthlessly detailed and revealing in the mid-range, without being obviously 'forward' or 'shouty' (a balance often employed by two-way designs to artificially enhance the impression of detail). As a result, these speakers aren't fatiguing, and I used them over long periods quite comfortably. It was easy to make EQ and dynamics decisions while mixing, and I had no nasty surprises when auditioning on other systems. Having the mid-range and HF level controls easily accessible on the front baffles also made it easy to tweak the balance quickly for sanity-checking purposes, too. My initial impression of the bottom end was less convincing, though, as it seemed a little lean and quite variable in comparison to my other reference speakers. Some tracks were quite punchy and weighty, while others were worryingly anaemic. However, with some experimentation I found that the balance really gelled together properly with the speakers in a near-field configuration, about 1.5 metres apart — so that'll be what they meant by 'close-field', then! The bass output from reflex cabinets usually only balances properly once you get the volume above a certain level, and that seems to be the case for the HG3s, too. When the monitors were used in this way, the bass was generally pretty tight and punchy, with surprisingly good extension when playing well-balanced music, while still ruthlessly exposing poorly balanced material! Overall, I liked the HG3s a lot, and the unusual design cleverly achieves excellent performance from a relatively compact cabinet. These are definitely worth auditioning if you're in the market for some high-performance monitor speakers. The current pricing for the HG3s places them amongst strong contenders like the excellent K&H O300s, PSI's A17, Geithain's M02, ATC's SCM16A and Genelec's 8250A. Of those, only the K&H offering is a directly comparable three-way design, although it is a sealed-cabinet monitor with waveguides to control dispersion and imaging. The man who conceived and developed the HG3 monitor is industry veteran Harvey Gerst, who designed JBL's F-series musical instrument speakers in the '50s and '60s, as well as working on various guitar and bass amps for IMC. He was also a platinum-record songwriter for the Byrds, a guitarist in the group Sweetwater, and has worked as both recording engineer and producer — so he's had a lifetime of experience from all sides of this industry. 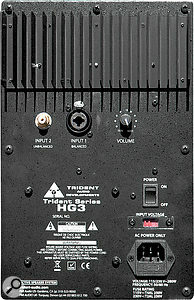 The amplifiers employed in the HG3 were designed by Russ Allee, a consultant engineer who has designed amplifiers for the likes of Alesis, Fender, Gibson and many others, while equipment designer Brent Casey project-managed the HG3 development and contributed the swivelling-pod arrangement. Very detailed and revealing mid-range. Smooth and well-extended frequency response. Interesting cabinet design and beautiful finish. Possible concerns regarding long-term reliability of 'pod' contacts. Large cabinet for near-field applications. An unusual design that combines the best traits of large monitors (extended bass) and smaller designs (precise stereo imaging). £2999 per pair including VAT. PMI Audio +44 (0)1803 612700.